Glass Agencies EROSE are manufacturer of Battery Hydrometer. The state of charge of a lead-acid battery can be estimated from the density of the sulfuric acid solution used as electrolyte. A Battery Hydrometers calibrated to read specific gravity relative to water at 60 degrees Fahrenheit is a standard tool for servicing automobile batteries. Tables are used to correct the reading to the standard temperature. Glass Hydrometer range 1100-1300 with coloured zones; blue, white, & red for charged, partly charged, & uncharged conditions respectively. Glass body, compressible rubber bulb, & rubber tube with fitting to body in card box. Battery Hydrometer- Engineering Lab Training Systems (Product Code - NLE-Export-230036): Indian Make. Pipette type, comprising glass float calibrated having coloured zones for charged, partly charged and uncharged conditions. 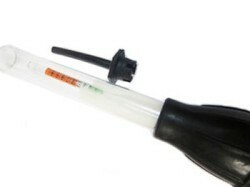 Compressible bulb and rubber tube with fittings to glass body. BULK ORDERS: Thomson Battery Hydrometer :- The state of charge of a lead-acid battery can be estimated from the density of the sulfuric acid solution used as electrolyte. 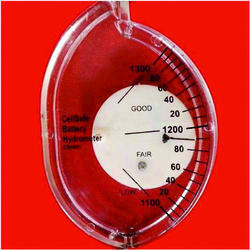 Battery Hydrometer are available in two sizes Small & Big.